Villa Yolanda has wonderful views over the open sea towards Albania's coastline. It's also only 15 minutes' walk downhill into Kassiopi's central harbour where many great tavernas offer tasty food and a warm welcome. There are several quaint local shops nearby as well as attractive beaches, the nearest also being 15 minutes' walk away. The house has a large private swimming pool with a fantastic raised dining terrace, and the scenic views are visible from both floors. Air conditioning/heating in the bedrooms, pool heating and WiFi are included. The panoramic sea views are simply stunning. Kassiopi Harbour and beach are a short walk away too! The spacious, sea-facing covered dining terrace is level with the ground floor, and there's a brick BBQ for enjoying fresh homecooked food, overlooking the pool below. Steps and a sloped pathway on either side of the terrace lead down to the swimming pool on the lower ground level, where there's plenty of space to sunbathe. You'll also find a pleasant chill out area with seating and a coffee table. Attractive flowering bougainvillea around the terrace adds a splash of colour too. A steep track leads to the gated private parking area outside Villa Yolanda. The main entrance is via the front porch on the ground level. Access to the lower ground level is external only, with doors from the kitchenette and twin bedroom opening out on to the terrace and pool area. The open plan lounge, dining area and kitchen has large arched patio doors at the far end framing the wonderful sea view, opening onto the dining terrace. There's comfortable seating around the flat screen TV and a table and chairs, as well as a handy breakfast bar, ideal for your morning tea or coffee. On the ground floor is a double bedroom and a twin bedroom which share a separate shower room. Both bedrooms have patio doors opening onto the large wraparound terrace where you can sit and enjoy mealtimes against a glorious backdrop of the open sea and hillside. The remaining bedroom - a twin with en suite bathroom - is on the lower ground level of the house, accessed externally from the pool terrace. This bedroom also has a small kitchenette with a table and chairs, and patio doors on either side. This villa is registered and licenced by EOT Greek licensing association. This number is: 0829K122K118100. 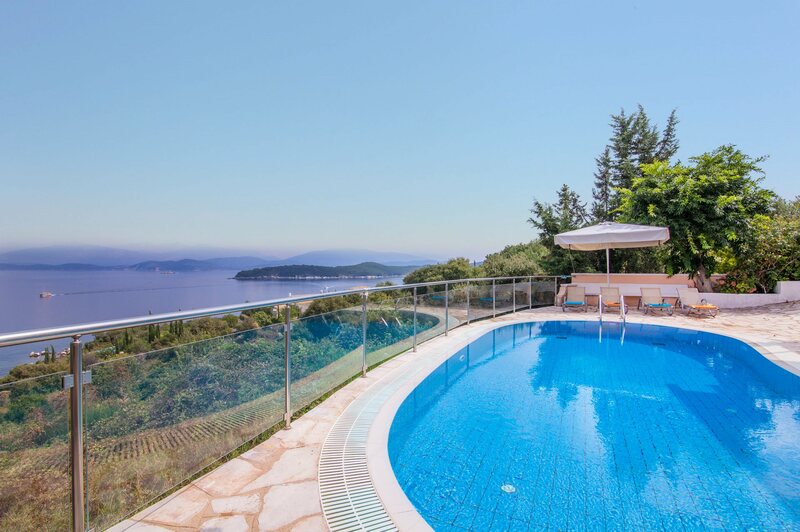 Perched just above the seafront, Villa Yolanda is around 15 minutes' walk from the centre of Kassiopi and the nearest of its several small beaches. Life here revolves around the harbour, lined with many excellent tavernas and quaint shops. The harbour is overlooked by the remains of its ancient castle, which is illuminated at night creating a wonderful atmosphere. The resort has a few small pebble beaches around the headland, with the larger beaches of Imerolia, Coyevinas and Avlaki all less than 10 minutes' drive away. Kassiopi has several shops selling clothes, souvenirs and beach accessories, and there's a handy mini market within a 10 minute walk for daily essentials and BBQ supplies. The road leading into Kassiopi has a few good tavernas, with a much larger choice to be found around the harbour. There are both modern and traditional restaurants, as well as a few lively bars with TV sporting events, karaoke and Greek dancing. The harbour is overlooked by the remains of Kassiopi's 15th Century castle which is lit up at night, creating a wonderful ambience while you dine. Kassiopi has several small but pleasant pebbly beaches around the headland, ideal for sunbathing, swimming and snorkelling. The nearest is Kassiopi Kalamionas Beach, 15 minutes' walk away, which has a couple of restaurants overlooking the waterfront. Kassiopi's Bataria, Pipitou and Kanoni beaches are further around the headland, on the far side of the harbour. Or you can visit the longer shingle beaches of Imerolia, Coyevinas and Avlaki, all within a 10 minute drive. Children will love paddling and snorkelling in the sea at any of the nearby beaches. You can also venture 20 minutes' drive west to the popular Hydropolis Waterpark in Acharavi. The larger Aqualand Waterpark is an hours' drive back towards Corfu Town. From the harbour, a steep rough track leads up to the remains of Kassiopi Castle, which has superb views over the waterfront. If you want to venture out but don't want to drive, motorboats can be hired locally to explore the stunning bays of Kouloura, Kalami and Agni along the North East Coast. Alternatively, the breath-taking views from both Paleokastritsa and Mount Pantokrator are certainly worth seeing. There are also various quaint little Greek villages to explore, and no trip to Corfu would be complete without a visit to Corfu Town. The towns charming shops, lively market, restaurants and bars, marina and fortress make it a great day trip! Villa Yolanda is not available to book for season as it is sold out. Take a look here at the Corfu villas that are currently on sale. The holiday was a great success because Villa Yolanda is an outstanding Villa and its location is amazing. The town of Kassiopi is perfect and the restaurants are superb and the local people are friendly, kind and fun. Typical Greek villa with spectacular views over the water and Albania, the pool was excellent and was very clean. Maria the cleaner and George the owner were very friendly and helpful. Short walk down to Kassiopi through local streets. If you love Greece, Greek food and Greek people you will love this location. Villa Yolanda is a lovely house in a fabulous position and extremely clean and tidy. We had a great holiday - our second with Villa Plus. The view from the villa was spectacular, overall we had a nice holiday, this is our third year with Villa Plus.